My granddaughter loves dressing up. She really loves her princess dolls and feels like she is dressing up just like a princess when she puts a dress on. 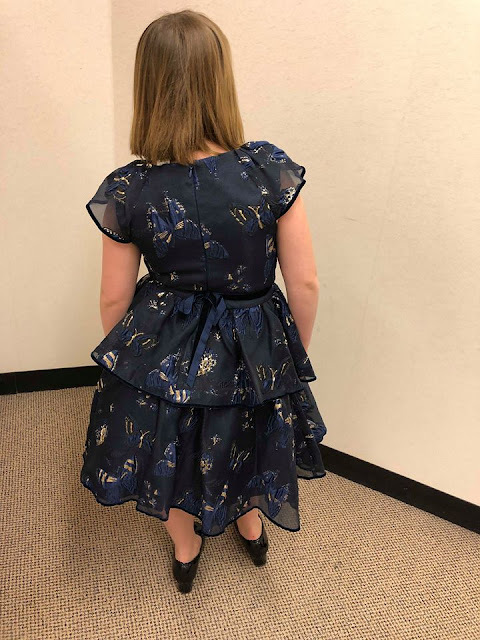 Recently I had the opportunity to review a gorgeous dress from David Charles. 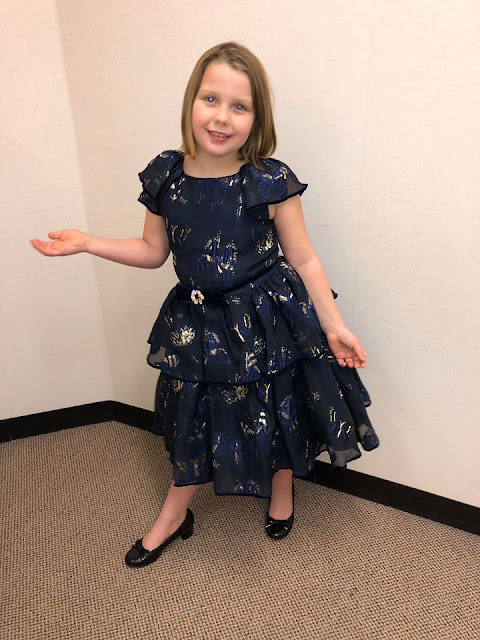 Both my granddaughter Leah and I were excited about this Navy Butterfly Tea Dress. When it arrived it was even more beautiful in person than when we viewed it on the David Charles site. Leah wanted to try it on right away. I allowed her to wear it for a bit that day as we had company over, she was so overjoyed to have it on. Leah was glowing as she received so many compliments on her new dress. The dress Leah is proudly wearing is called the Navy Butterfly Tea Dress. This piece is far from ordinary, it was designed with love. 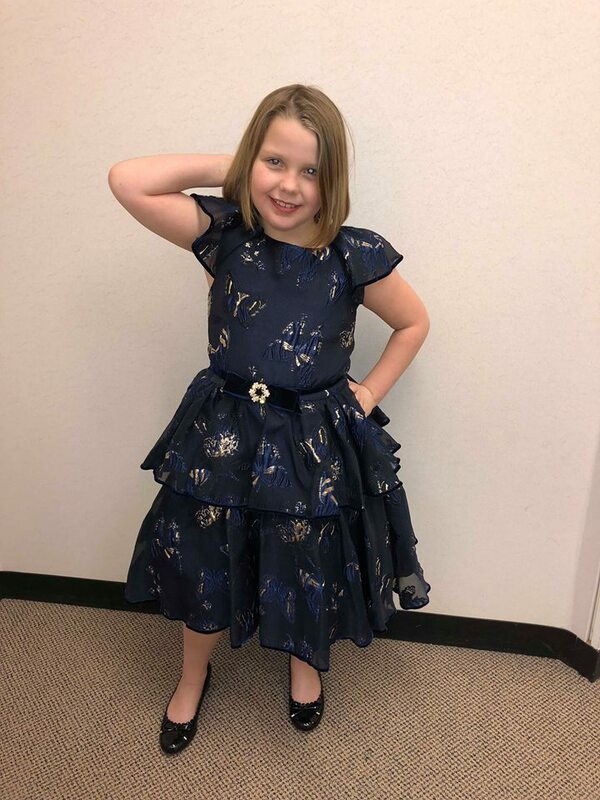 This soft tiered gown is available with a seasonal navy blue and gold color palette with a beautiful butterfly applique. The artisan tea dress offers a pretty ball gown silhouette with sheer cap sleeves and luxurious layered skirt. Signature details of this dress include a velvet navy trim throughout and a jewel encrusted waist bow. The zipper is concealed. Its 100% polyester with a 100% acetate lining. The dress fit my granddaughter perfectly. You can tell right down to the small details, a lot of love and care went into designing the dress. It is perfect for a wedding, birthday, Christmas, Hanuka or any other event. Your young lady will love this as much as my granddaughter does. It is quite easy to launder or dry clean. I would choose David Charles again for any special occasion. The styles are gorgeous and trendy. The gowns are made using high quality material and designed with perfection. Any of the dresses would be an excitement if a young girl were to find it beneath the tree this holiday. 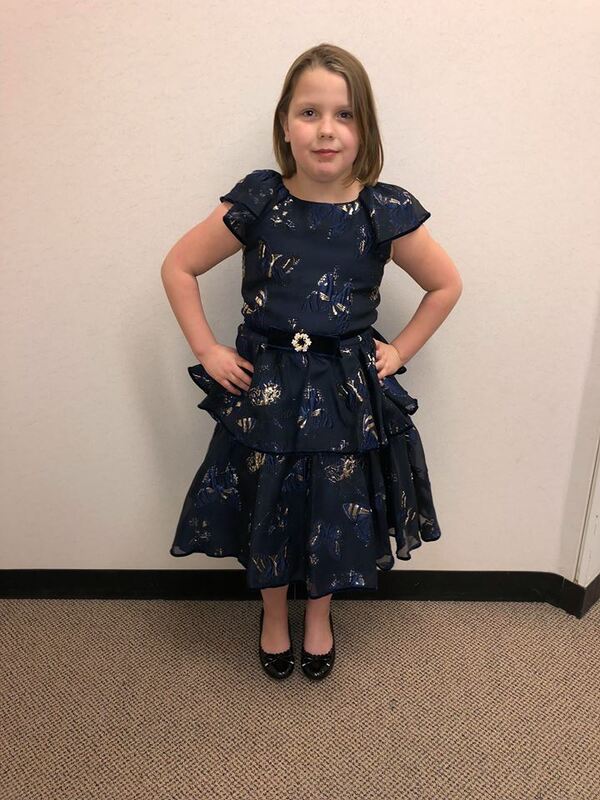 David Charles designer dresses by Gail Ingram ages 2-12 years. Perfect for special occasions. Since 1970 David Charles has been at the cutting edge of design and quality of dream designer dresses from 2 years to teens. They Supply the finest stores in the world such as Harrods in London, Neiman Marcus and Saks Fifth Avenue in the USA and many more. David Charles was founded in 1970 by a wife and husband team David and Susan Graff. David Charles has grown to become the most coveted and admired name in British party wear and special occasion dresses. Entrepreneurs David and his young wife Susan trained in fashion design at the prestigious Lucy Clayton school and were soon recognized as visionaries in the field of children's clothing. They were the first to translate women's high fashion trends in to irresistible designs for girls age 2 through 16 period styles that were equally loved by children and their parents. These were to include children's party dresses, formal dresses, special-occasion dresses, wedding and guest dresses, birthday celebration dresses and more casual everyday dresses that were trendy and chic. This iconic British brand is admired and worn by royalty and celebrities alike. David Charles has dressed the princesses Eugenie and Beatrice and the daughter of Princess Caroline of Monaco. I absolutely love it , love the bit of ruffles it has. I love her hair style. That is a gorgeous dress. it is a perfect length and love how it covers her shoulders. I find so many dresses for little ones are always tank style which I don't really like but this dress is beautiful! What a beautiful dress. Very pretty! what a pretty dress! so chic and very princessy! The little princess look gorgeous and is the dress shimmery? It looks so. Lovely princess dress. Aww, You looks so lovely. You are the cutest little lady have ever seen today. Your dress really looks great on you. This dress is absolutely amazing. The design and the color is just perfect! That dress looks so pretty on your granddaughter! What a fun way to look festive this holiday season and beyond! She does look like a little princess in that dress! Adorable and festive! She looks like a little princess in her dress! So beautiful! Aww!! she is so beautiful in her Christmas dress. I love the design and the color of her dress.